Choosing gifts can be difficult – especially if it’s for someone you don’t know very well, but want to show your appreciation to by giving them a token of your gratitude. It is precisely in such situations that gift baskets can come in handy. They make for excellent gifts because they can be assembled with a variety of different little gifts, and there is so much room to play around and make up the right combination of gifts. There can be many reasons why you may want to send someone a thank you gift basket. For instance, you may wish to thank someone who has played a sort of local host or guide to you on a particular holiday, or to someone who has helped you with something you needed help with, or simply someone who has been there for you when you needed them. Gift baskets can look great, and you control the budget of your gift by way of what you include in the basket. Themed gift baskets are a great way to build a gift basket around a particular concept. You can use your favorite city or a city you’ve recently been on holiday to as a theme around which to create your thank you gift basket. This can include memorabilia from the city, souvenirs from local hotspots and attractions, or things that the city is famous for – such as local foods, or crafts. represent the best of all the goodies that available in a particular place. You can also make specifically themed baskets from your favorite city. For example, you could make a food themed basket from the city of London. London can be said to represent the entire country – so you can include goodies like local jams or preserves, shortbread, cookies, and other local delicacies. 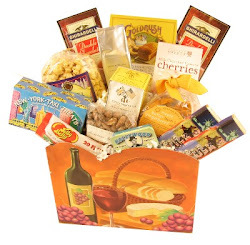 Thank you gift baskets that are built around the theme of a particular city can also include objects that the city is well-known for, including local crafts and arts, or objects that represent local activities, for instance mascots of local sports teams, or local wildlife! The point of a themed gift basket is for all the things in to come together and represent that theme! At the same time, each individual component of your thank you gift must also be useful and aim to delight the recipient! Since it is a destination specific gift basket, your basket could also contain helpful information about the destination – such as travel guides or books, or local maps. You can include nearby attractions if possible, so that people could use the information if they’re in the city, or when they visit. You could also include gift vouchers or gift cards for local attractions or local shopping opportunities. With a little inspiration and creativity you can put together a delightful gift basket filled with goodies from your favorite city. Depending on who the gift is for, you can customize the things you put into it. And if you prefer to have it done professionally, the good news is that there are professional companies that specialize in destination specific gift baskets.